We are looking for experienced, native-speaking tutors (English tutors from UK or USA, Canada, Australia, New Zealand, South Africa, 經驗英,美,加拿大土生土長/成長受教育華人導師 are also great ), as well as native-speaking tutors in Spanish, French, German, Japanese, Korean, Italian. HKD400-500 for one hour (depending on student-teacher locations), HKD600/1.5hr, or HKD800/2hrs. ​If you are interested in part / full time teaching jobs. 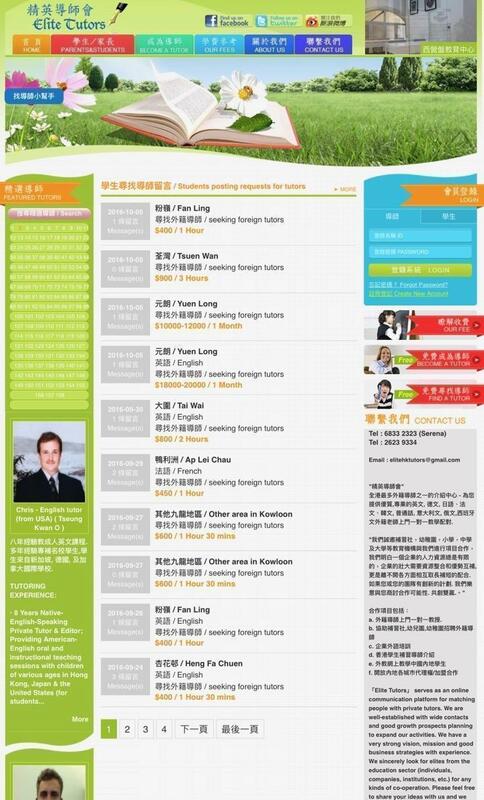 Please kindly register as a tutor on our website (www.elitehktutors.com). You only need do it once. Please focus on listing out your teaching experience. If you were/are a teacher of primary, secondary school, kindergarten or Language learning centre, please mention it as it will attract more students. Submitting a nice photo with a smiling face will be wonderful. Please let us know when you have completed registering on our website as our tutor. We will then send your teaching CV to the student/parents/school to look over your profile in consideration for any specific job posting. 1. You can leave a message in that tutoring case, or email/Whatsapp us mentioning which job you are interested in. 2. Moving forward, we will regularly send new tutoring jobs to your email. 3. If we believe you are the right fit for a particular posting, we will send a Whatsapp message to you. Thank you so much! Looking forward to working together with you in the near future.